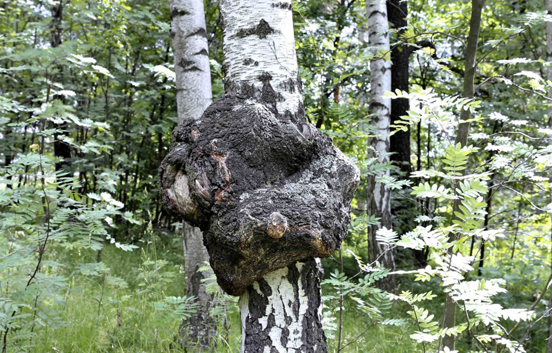 Whether you call it Chaga Mushroom, True Tinder Fungus, or Inonotus obliquus, chaga is a parasitic fungus commonly found on Birch and some other hardwood trees in Russia, Northern Europe, and the Northern US and Canada, Russia, Siberia and other parts of Asia. It is a non-toxic fungus in the Hymenochaetaceae family and has numerous medicinal qualities. At first glance, the mushroom doesn’t look very appealing; actually, it doesn’t even looks like a mushroom at all! Appearances can be deceiving, however, as this special mushroom packs a punch when it comes to its health value. Few of the common names of the mushroom are Cinder conk, Birch conk, Clinker polypore, Chaga Mushroom, True Tinder Fungus, black mass and birch canker polypore. The name “chaga” (pronounced “tsjaa-ga’) comes from the Russian word of the mushroom (Anglicized from czaga), which in turn is evidently derived from the word for the fungus in Komi-Permyak, the language of the indigenous peoples in the Kama River Basin, west of the Ural Mountains. It is also called “The Mushroom of Immortality” by the Siberian Russian Shamans and the “Diamond of the Forest” by the Japanese, Chaga earns its moniker, “The King of the Medicinal Mushrooms” due to it being one of the most powerful antioxidants in the world. 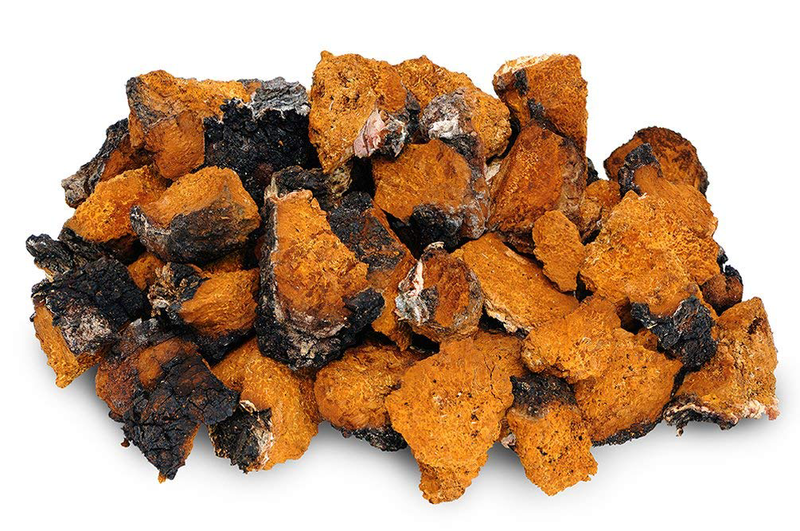 Chaga consists of a variety of substances such as polysaccharides, betulin, betulinic acid, and inotodiol, and is said to offer a number of health benefits. It has been used by many major Northern climate dynasties for health and healing. 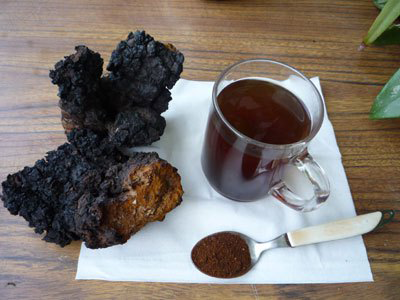 Chaga mushroom can be eaten as a food, and is also made into tea, syrup, bath agents, and extracts. It is an important functional medicine for the apothecary to help modulate and boost the immune system. It also tastes like chocolate. Chaga mushroom is a tough, woody parasitic fungus that commonly grows in cold northern climates, specifically on birch trees. It grows in a “conk” form. Found mostly on white, yellow, and black birch trees they can be found on other hardwoods. Thriving on the cold winter climates of its environment it only grows in the wild, and repeated attempts to cultivate it have all ended in failure. The sterile conk is irregularly formed and has the appearance of burnt charcoal but is distinguished from other growths by its orange tissue. It is not the fruiting body of the fungus, but a mass of mycelium, mostly black due to the presence of massive amounts of melanin. 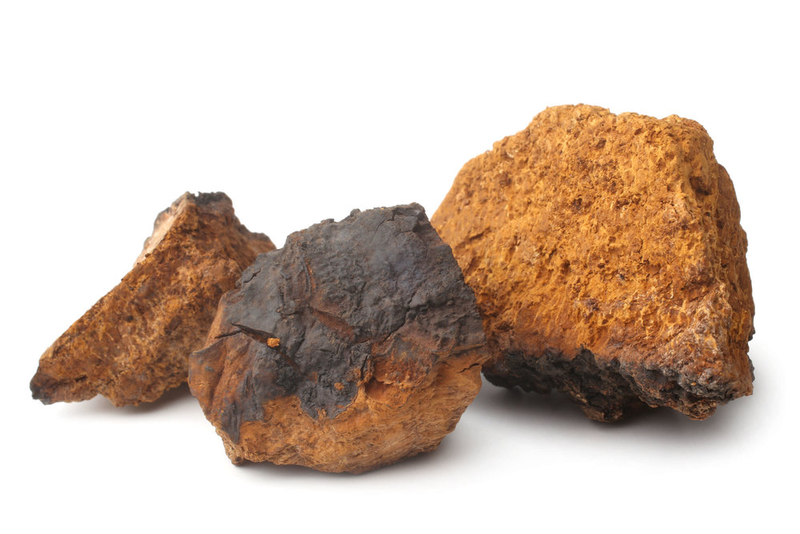 Chaga is a mushroom that contains medicinal properties that can help strengthen and heal the body naturally. 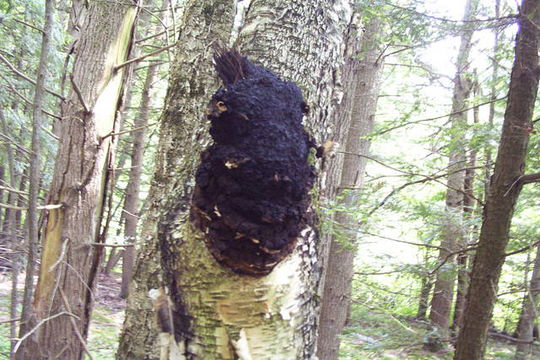 Chaga takes three to five years to reach a harvestable size. Once harvested, chaga can take up to a decade to regrow to a harvestable size. Practice mindful harvesting techniques and do not remove the entire fruiting body from the tree. The mushroom has a hard texture, so it traditionally made into a powder and brewed for a long time in hot water to make a chaga beverage (often called chaga tea or coffee). It is also available as a dietary supplement and tincture (a liquid extract). Our skin needs protection! Chaga is wonderful for both internal and external use. In addition to containing melanin (the pigment in your skin responsible for sun-protection) Chaga is also fights infection, promotes good circulation, and reduces inflammation. Chaga mushrooms consist of good amount of antioxidant superoxide dismutase (SOD). This is considered to be among the most powerful antioxidants in the body that fights free radicals and stops inflammation. Chaga mushroom has the highest oxygen radical absorbing capacity (ORAC) or the highest antioxidant capacity among mushrooms, with an ORAC score of 146, 700 μ mol TE/100 g.1 To put this in perspective, this value is way more than that of dark chocolates or most berries, common antioxidant foods. Heart disease or stroke is caused due to the higher cholesterol levels in the blood. To reduce your cholesterol levels, include chaga mushrooms in your diet. Antioxidant content present in chaga prevents cholesterol buildup in your blood and restrains the cholesterol-increasing activity of high-fat diets. Chaga tea also consists of other compounds known as triterpenes. Triterpenes are special compounds which can break down LDL cholesterol in your body before it can be absorbed into the blood stream. If you want to lower or maintain your cholesterol levels, drinking a mug of chaga tea every day might do the trick. Platelet aggregation occurs when blood cells clump together and form clots. Occasionally, platelet aggregation can cause blood clots in veins (thrombus), which can ultimately lead to heart attacks or strokes. If you frequently suffer from stomach upsets or bloating, your digestive enzymes could be to blame. If your body isn’t able to produce sufficient amounts of digestive enzymes, then you end up suffering from poor digestion. 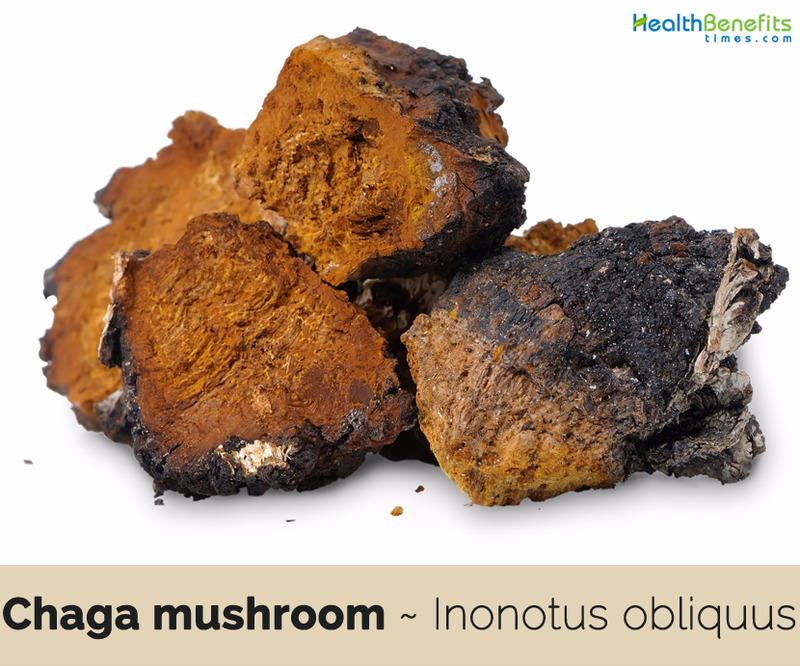 Chaga mushrooms encourage the secretion of digestive enzymes and ensure proper digestion. Anti-microbial and anti-inflammatory properties of mushrooms can also protect your digestive tract and facilitate the entire process of digestion. Consumption of chaga mushroom has been associated to improved memory and better learning. Research revealed that the methanolic extract of chaga fed to mice for 7 days resulted in an enhanced cognitive function. By decreasing oxidative stress in the brain, the mushrooms can protect the brain cells from damage and boost their function. Chaga extracts are capable of increasing liver function and aiding detoxification. 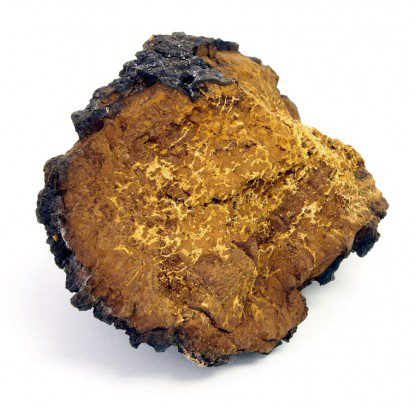 Chaga shields your liver from harmful toxins and prevents cytotoxic injury. It also protects your liver from disease by reducing oxidative damage and preventing the leakage of liver enzymes like ALT (alanine transaminase). If you are a fitness enthusiast or are looking for ways to exercise without immediately feeling tired, you might want to consider chaga mushroom. Research revealed that chaga mushroom can increase the duration of physical activity (swimming, in this case) in mice and reduce exercise-induced fatigue. This energy-boosting ability of chaga mushroom makes it a potential remedy for fatigue, particularly if you’re performing intense workouts or running marathons. Chaga mushroom consists of high levels of the antioxidant superoxide dismutase (SOD). It’s hailed for its ability to fight oxidative stress as well as aging-related changes caused by free radicals. Thus, consumption of chaga can increase longevity and delay aging. Also, chaga mushrooms are rich in vitamin C, which is known for its ability to prevent wrinkles, loose skin, and other signs of aging. 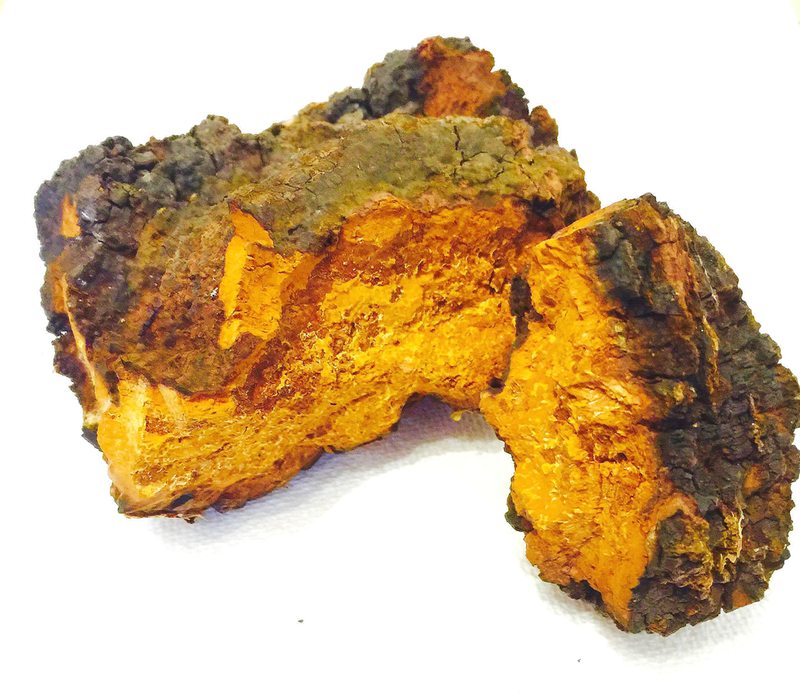 Chaga is supposed to reduce inflammation, boost the immune system, enhance liver health, and fight viruses. Chaga has anti-tumor activity and can help treat and/or prevent some forms of cancer. Regularly drinking tea from chaga protects against stress, permanently increasing the body’s resistance to disease and bestows longevity. Chaga mushroom relieves pain, stops muscle spasms, stimulates removal of salts and toxins from the joints, and considerably slows aging and destruction of cartilage. It has been used as a folk remedy for cancer, digestive system diseases, and various ailments in Russia and other northern European countries. 60 years ago, Finlanders use chaga as a coffee substitute. 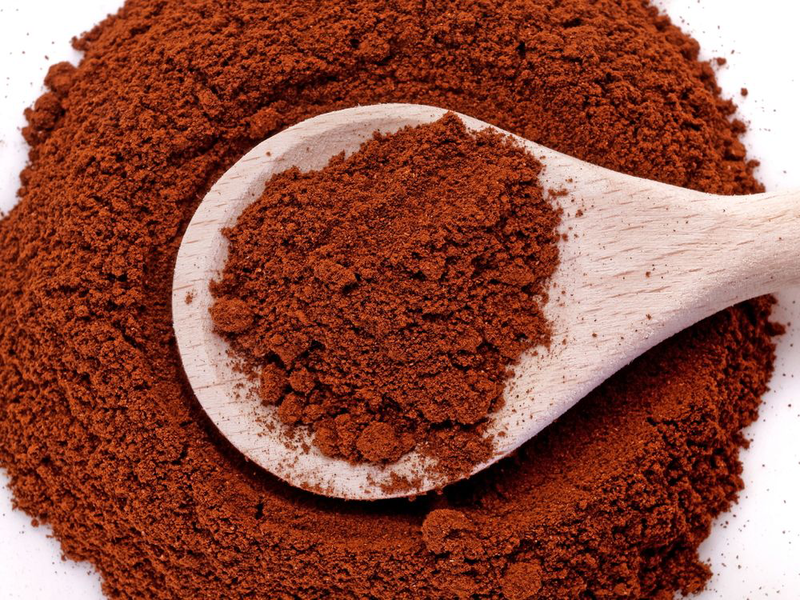 As a functional food, ground or powdered chaga can be added directly to a tomato-based sauce, chili, or chocolate-and-peanut butter–based dessert or smoothie. 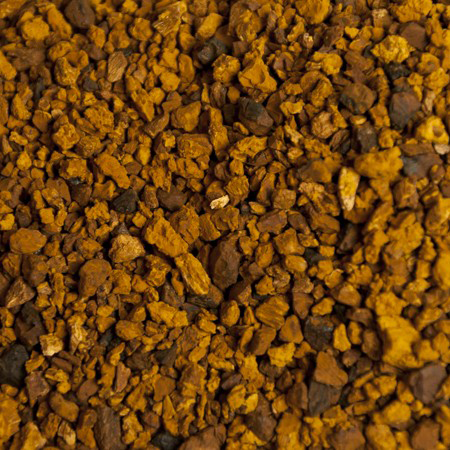 Chaga is delicious when added to boiled stovetop coffee or chai, providing deep chocolate notes to the brew. It also makes a fine hot chocolate when mixed with cacao. Local beer brewers are starting to add chaga to brews of porters and stouts to add chocolate flavor. The most popular way to consume chaga is by drinking a delicious cup of chaga tea. Below is a simple chaga tea recipe for you to try at home. 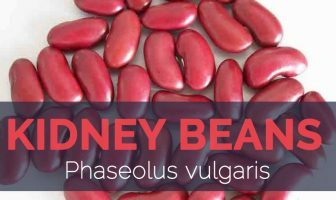 It may increase the effects of anticoagulant, antiplatelet and anti-diabetic herbs. Continue taking all prescribed medications, as chaga is not a substitute for traditional medicine. Tell a doctor about all medications being used. As with other drugs and supplements, chaga may alter the effectiveness of various medications. Chaga can trigger an allergic reaction in some people. Trouble breathing, changes in heart rate, and loss of consciousness are medical emergencies. Avoid using other herbal supplements while taking chaga, unless a doctor advises otherwise. Chaga can lower blood sugar levels. You should not take Chaga in combination with diabetes medicine because it may cause blood glucose levels to fall dangerously low. People with autoimmune diseases should avoid using Chaga because it can cause the immune system to become more active. Growing Climates Cold northern climates, specifically on birch trees. It grows in a “conk” form. Chaga Mushroom contains over 215 Phytonutrients. Boletus obliquus Ach. ex Pers. Mucronoporus obliqua (Ach. ex Pers.) Ellis & Everh. Phaeoporus obliquus (Ach. ex Pers.) J.Schröt. Phellinus obliquus (Ach. ex Pers.) Pat. Physisporus obliquus (Ach. ex Pers.) Chevall. Polyporus obliquus (Ach. ex Pers.) Fr. Poria obliqua (Ach. ex Pers.) P.Karst.